Since 1989, the Symposium on QFD has been showcasing various QFD applications, research, innovation in new product development and business projects. 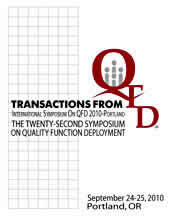 The compiled abstracts represent the papers which were presented at the QFD Institute's North American Symposia as well as International Symposia which were hosted by QFDI. Each volume is US$75 - US$125 plus shipping and handling. To place an order, please use Order Form (MS Word file). For questions, please Contact US, TEL 734-995-0847. Copyright © 2000-2011 by QFD Institute. All rights reserved. QFD Gold Belt®, QFD Green Belt®, QFD Black Belt®, QFD Red Belt®, and Blitz QFD® are registered marks of the QFD Institute.